After a major earthquake, modern communication devices will likely fail us. Cell networks will be damaged or jammed, landlines will be down, and internet will not be functioning. Two-way radio will be our best method for communicating long distances post-earthquake, and amateur radio operators will be in high demand. Disasters that are more familiar also demonstrate the need for amateur radio. On Sunday, December 2, 2007, a Force 3 hurricane hit the Oregon North Coast. In Oregon, it topped out at 126 mph. The coast lost all line-power, all landlines, and all cell towers. Authorities soon discovered that their satellite phones could not penetrate the storm’s dense raincloud cover. All roads were closed, sealed off by fallen trees. Highways US 30, US 26, US 101, OR 6, and 22 were closed. The North Coast was isolated and silent. The State cannot declare an emergency for one of its jurisdictions; only the county can initiate this request. The only means the counties on the coast had to declare this emergency to State authorities in Salem was by amateur radio. Only then could the State send emergency services and supplies to the coast. Amateur radio will be important to NETs in a disaster, but other radios can play different, important roles as well. As NET members, we will also be using unlicensed and perhaps some commercial radios. For this reason, we step back and look at radio more broadly. NET members will use radio communication in several ways. Different uses will have different requirements. Some communication will naturally be local, while other communication must be across the city or even farther. Because cost and complexity tend to follow the capability of a radio, it is useful to understand enough about the different needs and radio features to make good choices. 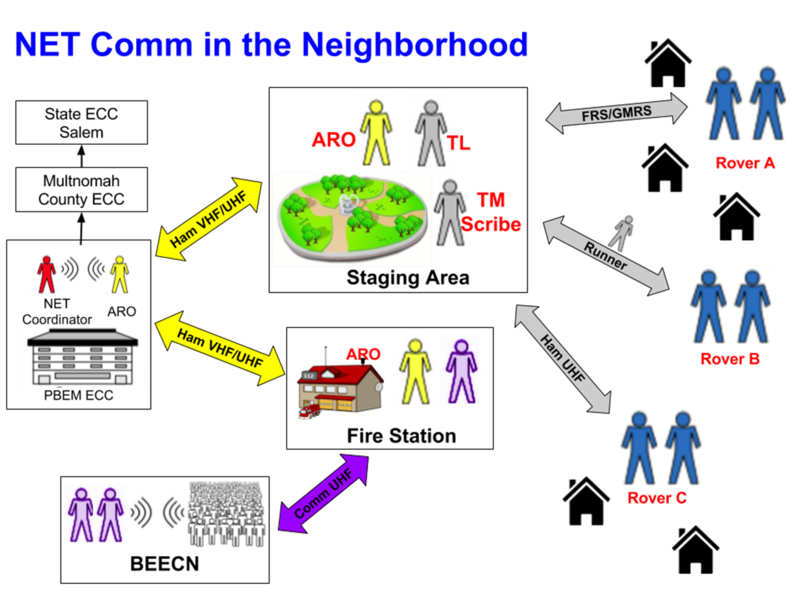 As illustrated in the figure above, NET and BEECN participants will have several different kinds of communications needs. NET and BEECN tactical communications (intra-team) will typically be short range, between perhaps a few hundred feet to perhaps as much as two miles. Much of the NET intra-team communication will take place among rover teams, performing search and rescue (SaR) operations. The BEECN teams will be assisting community members by providing information and a communications link to the ECC. These two- to four-person teams typically will not have much experience operating radios, much less personal radio licenses like amateur radio licenses. Several kinds of radio, however, will meet this requirement. FRS radios do not require a special operating license. BEECN radios use commercial licenses, and untrained operators operate under the City of Portland’s operating license. GMRS radios are more powerful than FRS radios, and they do require an operating license, but the license requires only the payment of a modest fee and is good for ten years. We discuss FRS and GMRS radios on the page by that name. We do not discuss the BEECN radios further, but we will point out that operation of these radios effectively requires the same level of skill as required for FRS/GMRS radios and, for that matter, amateur radios. NETs that need to coordinate their resources to address larger or expansive problems (inter-team) may need to communicate five or six miles. Rover Team C in the figure above, for example, could belong to a different NET than that in figure’s staging area. To communicate over obstacles and for greater distances, the advantages of amateur are helpful. These include special antennas, better power supply, and higher transmission power. For this situation, the NET Program has secured special UHF channels. The page NET ARO UHF Frequencies describes those channels. Because the Portland Emergency Coordination Center (ECC) will be coordinating both NET and BEECN activities (Team-to-ECC), radio communications across the entire city and around obstacles like hills will be necessary. For BEECN, this leg of the communication will be between fire stations and the ECC. Here, amateur radio is the designated solution. Communication across larger area and among more operators requires more efficiency and experience. Formal message handling skills and experience with large, directed radio nets are critical. The PortlandPrepares.org pages on Ham Radio and the ARO Certification Program delve further into these subjects. Many of the details of how your particular NET will use radios and AROs, however, is left up to the Communications Section of your NET’s Operating Plan. The PBEM NET Program does not dictate these. Instead, each NET is expected to write up these choices in the Communications (or Comms) section of its Operating Plan. The Comms section is where the NET will address such important questions as the following. How will NET members communicate with each other immediately following a disaster? How will the NET Amateur Radio Operator (ARO) communicate with the Portland Bureau of Emergency Management’s Emergency Coordination Center (ECC)? Where will the ARO Deploy? Somewhere else, like a served agency? If appropriate, how will the ARO remain in contact with the Team Leader? If there are multiple AROs, who is primary or “designate” ARO, and what is the protocol to replace the primary ARO? What jobs will supporting AROs have? If your team has no ARO, what arrangements has the team made to avail themselves of an ARO, perhaps borrowed from another, nearby team? Which FRS/GMRS channels will be used? What should be in radio go-kits for ARO and FRS users? How do you plan to cooperate with surrounding teams?